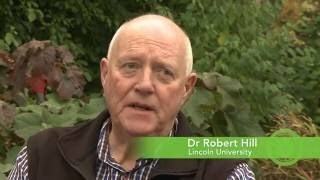 Dr Robert Hill, Principal Research Officer, Bio-Protection Research Centre, Lincoln University has developed a breakthrough, environmentally-friendly approach to boosting plant growth and controlling disease in the forestry industry. If his work is adopted industry-wide, New Zealand forest owners could save around $50 million a year. His method, which uses a fungi known as Trichoderma, has already done great things for the Malaysian timber company, Grand Perfect. Their Acacia nurseries no longer use fungicides and crop mortality has dropped from 50% to 10% or less, not to mention the fact that seedlings are ready sooner than usual for forest plantations. Two of New Zealand's largest export crops – timber and kiwifruit – have also benefited from this work. As part of a NZ Forest Owners Association funded project, Dr Hill's approach led to a 20% rise in pine tree growth rate and a 33% drop in crop mortality. Zespri has invested in Dr Hill's technology to deal with the significant risk that PSA disease poses to the New Zealand kiwifruit industry. Several Trichoderma that increase growth and reduce disease losses have already been identified. The potential benefit to the New Zealand kiwifruit industry is great.